This extension is a complement to Send updates by email. 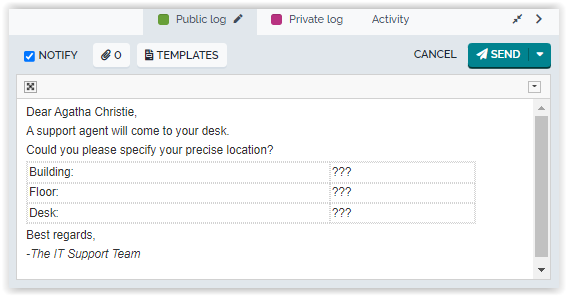 It provides a quick way to fill the case log field by picking from a list of “precanned” answers. The answers are organized into Categories and Organizations (supporting multi-tenancy). Support of multi-tenancy: each Organization can have its list of “precanned” answers. 2018-01-26 1.1.2 Add Russian translation. 2016-08-08 1.1.1 Compatibility with iTop 2.3.0 (formatted text) and bug fix to support pagination in the popup dialog for selecting a reply. 2015-09-29 1.0.5 Compatibility with iTop 2.2.0 and custom portals. 2014-12-10 1.0.4 Cosmetic on the module name (internal). 2014-09-25 1.0.3 Better initial sizing and positioning of the dialog box. 2014-09-15 1.0.2 Handling of the dialog's resize. Localization of the dialog's title. Can be activated only on a single class of object, also it can be an abstract class. This extension requires the Send updates by email extension to be installed as well. If you have just installed the prerequisite extension Send updates by email, you will have to read its configuration chapter. This module has a default configuration that cannot work. 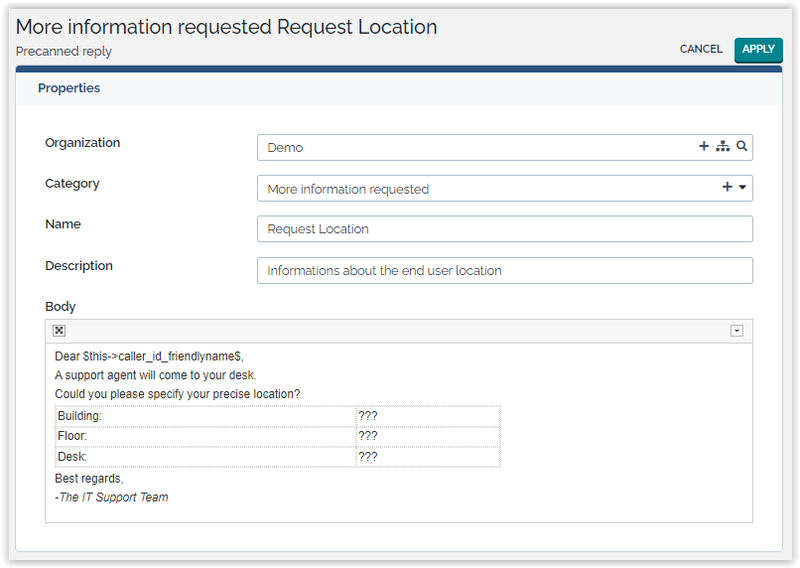 In the iTop configuration file, the administrator defines on which class the precanned replies option will be proposed and in which CaseLog the reply will be copied. Also the field 'public_log' does not exist on Ticket class, it works. When modifying a ticket with no 'public_log', such as a Change or a Problem, it just ignores silently this configuration parameter. The “Body” field contains the text that will be added into the case log of the ticket when using this precanned replies. 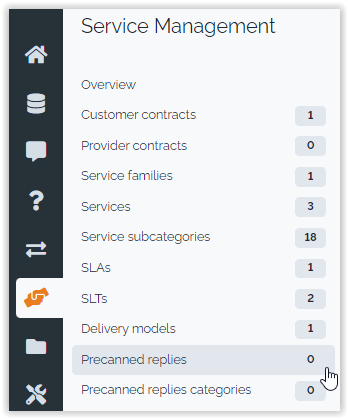 If you have configured the attachments to allow them on Precanned Replies, you can add attachments to the Precanned Reply using the “Attachments” tab. You can use the search criteria at the top to filter the list. When submitting the modifications to the ticket, the case log will be updated, as if the answer was typed manually. The attachments are only sent by email: they are not added to the ticket. If the checkbox “Send the reply by email” is checked, an answer will be sent by email, as explained in Send updates by email.